Early 20th Century U.S. 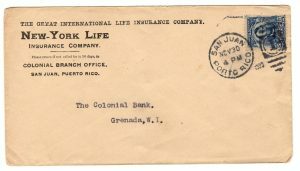 Postal History – Exploring early twentieth century postal history via the United States 2nd Bureau definitive series of stamps. 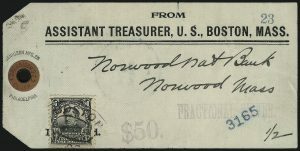 Registered tag attached to a U.S. Treasury bag filled with $50 dollars of FRACTIONAL CURRENCY (see handstamp). Fifty dollars worth of silver coins weighed 1250 grams or 2.76 pounds. The uncommon solo $1 Farragut franking paid for the 8¢ registry fee and up to 46 times the 2¢ letter rate for up to 2.875 pounds (silver plus canvas bag). This site is dedicated to the United States 2nd Bureau issue of postage stamps. Designed in 1902 and produced later that year and continued into the following year, the 2nd Bureau series of stamps consisted of fourteen denominations (1¢ to $5) plus a special delivery stamp. Shown nearby, are examples of postal history from this era. Many of the stamps were well received by the public, including the first regular U.S. stamp featuring a woman, the 8¢ Martha Washington. However, the public disliked the design of the 2¢ George Washington stamp, forcing the Bureau of Engraving and Printing to redesign and replace the stamp in late 1903. The 2nd Bureau stamps sought use from 1902 until 1909 when the 3rd Bureau issue (also referred to as the Washington-Franklins) were phased into use. 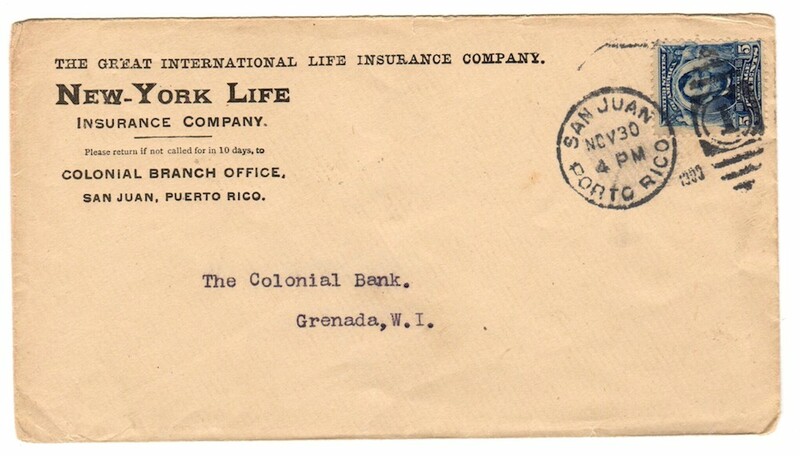 Commercial cover sent from San Juan, Puerto Rico at the 5¢ Universal Postal Union (UPU) rate to Grenada, West Indies. Mail to and from U.S. territories and Possessions enjoyed the same domestic rates as the mainland. I have had the pleasure of exhibiting my postal history collection three times with all attempts garnering a Vermeil ribbon (scans to my 2011 exhibit). The Gold award is elusive, but I look forward to its pursuit. Click on the tabs at the top of the page or the categories on the sidebar to explore my collection.